To investigate if shear wave imaging (SWI) can detect endoleaks and characterize thrombus organization in abdominal aortic aneurysms (AAAs) after endovascular aneurysm repair. Stent grafts (SGs) were implanted in 18 dogs after surgical creation of type I endoleaks (four AAAs), type II endoleaks (13 AAAs) and no endoleaks (one AAA). Color flow Doppler ultrasonography (DUS) and SWI were performed before SG implantation (baseline), on days 7, 30 and 90 after SG implantation, and on the day of the sacrifice (day 180). 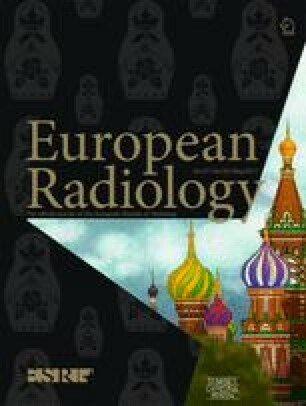 Angiography, CT scans and macroscopic tissue sections obtained on day 180 were evaluated for the presence, size and type of endoleaks, and thrombi were characterized as fresh or organized. Endoleak areas in aneurysm sacs were identified on SWI by two readers and compared with their appearance on DUS, CT scans and macroscopic examination. Elasticity moduli were calculated in different regions (endoleaks, and fresh and organized thrombi). All 17 endoleaks (100 %) were identified by reader 1, whereas 16 of 17 (94 %) were detected by reader 2. Elasticity moduli in endoleaks, and in areas of organized thrombi and fresh thrombi were 0.2 ± 0.4, 90.0 ± 48.2 and 13.6 ± 4.5 kPa, respectively (P < 0.001 between groups). SWI detected endoleaks while DUS (three endoleaks) and CT (one endoleak) did not. SWI has the potential to detect endoleaks and evaluate thrombus organization based on the measurement of elasticity. • SWI has the potential to detect endoleaks in post-EVAR follow-up. • SWI has the potential to characterize thrombus organization in post-EVAR follow-up. • SWI may be combined with DUS in post-EVAR surveillance of endoleak. We are grateful to Jocelyn Lavoie, RT, for preparing and organizing the logistics of this project. We thank Michel Gouin, RT, and Gino Potvin, RT, for their work on US and CT acquisition. We also thank the staff of the CRCHUM animal care facility for their expertise in animal experimentation and follow-up. The scientific guarantor of this publication is Dr. Gilles Soulez, MD, MSc. The authors declare no relationships with any companies, whose products or services may be related to the subject matter of the article. This study received funding by Fonds de Recherche du Québec – Santé (FRQS) (ARQ no. 22951) and the Canadian Institutes of Health Research (MOP no. 115099). G.S. is supported by a National Scientist award from FRQS. A.T. is supported by a Junior 1 Research Award from the FRQS and Fondation de l'association des radiologistes du Québec (no. 26993). Martin Ladouceur, PhD, kindly provided statistical advice. Institutional Review Board approval and written inform consent were not necessary because the study was an animal study. Approval from the institutional animal care committee was obtained. Some study animals or cohorts have been previously reported as part of an investigation of another elastography technique (non-invasive vascular elastography) . The methodology of this project was experimental.